Children have delicate feet that are still developing as they get older. Therefore, it is up to parents to make sure that their children’s feet are healthy. There are some things a parent can do or be on the lookout for. When it comes to footwear, parents should check their children’s shoes frequently to see if they properly fit. When it comes time that your children want to get pedicures, make sure that the salon they visit is clean; this can help prevent infections of the foot from fungus. Flat feet, ingrown toenails, and warts are not uncommon among children but can be taken care of. If you see anything abnormal with your child’s feet, see a podiatrist who can diagnose them. Making sure that your children maintain good foot health is very important as they grow. If you have any questions, contact Dr. Michael D. Garvin of Florida. Our doctor can provide the care you need to keep you pain-free and on your feet. Should You and Your Children Go Barefoot? Having your child play on the playground barefooted may be a good idea, according to some podiatrists and parenting experts. Its proposed benefits include proper foot function, foot development, better balance, and proprioception, which is how the body senses movement. Parents are recommended to try it themselves. Proponents point to studies that show how it strengthens the feet and legs, determining that people are less likely to suffer from conditions like bunions or corns. Going barefoot is still a debated topic and has its own pros and cons. If you or your child going barefoot interests you, be sure to check with a podiatrist to see if it's right for both of you. Barefoot running has its own share of benefits and disadvantages. If you have any concerns about your feet or ankles, contact Dr. Michael D. Garvin from Florida. Our doctor will treat your foot and ankle needs. - When running and landing on the front feet, the impact on the feet and ankle is reduced; this can reduce stress injuries. - It strengthens muscles in the feet, ankles and lower legs. - Balance of the body is improved, and there is a greater sensory input from the feet to the rest of the body. If you have any questions please feel free to contact one of our offices located in Port St. Lucie, FL. We offer the newest diagnostic and treatment technologies for all your foot and ankle needs. Stretching the feet is a great way to prevent injuries. If you have any concerns with your feet consult with Dr. Michael D. Garvin from Florida. Our doctor will assess your condition and provide you with quality foot and ankle treatment. Plantar warts are usually caused by walking around with bare feet in the warmer months. It is very common for warts to appear on the bottom of the foot, however it is possible for them to grow anywhere on the body. They can appear in different shapes, and may even appear in a clustered form. While there are a variety of ways that one can treat warts, the most traditional method is to undergo surgery. Warts can be very painful considering they often appear on the feet which bare most of the body’s weight. If a plantar wart goes untreated, it can become difficult to exercise and perform daily activities. Plantar warts can be very uncomfortable. If you need your feet checked, contact Dr. Michael D. Garvin from Florida. Our doctor will assist you with all of your foot and ankle needs. It is very possible for fungal infections on the feet to be misdiagnosed. 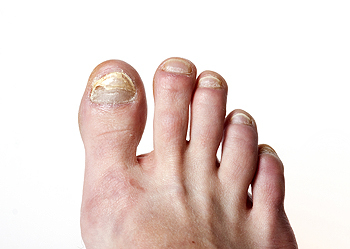 Approximately half the people who report signs of toenail fungus don’t actually have it. Instead, these people often have similar conditions such as psoriasis, pityriasis rosea, or maybe even skin lymphoma. Nevertheless, you should see your podiatrist if you suspect something is wrong with your feet instead of making the mistake of misdiagnosing yourself. When you see your doctor, he may want to send a sample of your toenail to a lab in order to properly diagnose your condition. If it is confirmed that you have a toenail fungus, you may be prescribed oral medication for treatment. For more information about treatment, contact Dr. Michael D. Garvin of Florida. Our doctor can provide the care you need to keep you pain-free and on your feet. If you have any questions please feel free to contact our offices located in Port St. Lucie, FL. We offer the newest diagnostic tools and technology to treat your foot and ankle needs. Researchers at Kansas University of Technology were able to develop a device that can measure pressure on human feet. The feet are responsible for carrying most of the body’s weight when a person walks, and as a result, they tend to endure the most mechanical pressure. Studying the pressure changes in one's feet can lead to the diagnosis of more serious problems such as diabetes, flat feet, and toe deformities. Flat foot is a treatable condition, and although the most common ways to treat it are by using special shoes and monitoring gait; analyzing the pressure in the feet can be beneficial as well. Flatfoot is a condition many people suffer from. If you have flat feet, contact Dr. Michael D. Garvin from Florida. Our doctor will treat your foot and ankle needs. In a game against the San Francisco Giants, Padres shortstop Erick Aybar suffered a fracture in his foot. Although he was able to stay in the game, he sat out for the rest of the series due to the injury. It is possible that the shortstop could miss the remainder of the season as a result of the fracture. Shortstop has been one of the least productive positions for the struggling 2017 Padres, but they are expected to look to their minor league system in order to find Aybar’s replacement. Going forward, Dusty Coleman and Allen Cordoba are expected to be frontrunners in terms of manning the shortstop position in Aybar’s absence. A broken foot requires immediate medical attention and treatment. If you need your feet checked, contact Dr. Michael D. Garvin from Florida. Our doctor can provide the care you need to keep you pain-free and on your feet. Flip-flops are one of the most convenient footwear options because of how easy they are to slip on and off your feet. While you may be tempted to wear them during the summer, you should avoid, or at least severely limit, doing so because they can cause a variety of problems. Wearing flip-flops can injure your Achilles tendon, lower back, and it may trigger plantar fasciitis. While flip-flops can be dangerous to wear on an everyday basis, they may not be as harmful if only used for short periods of time. If you want to wear flip-flops, you should look for a pair that has cushioning and offers arch support for your feet. Flip-flops are not always the best choice of footwear. If you have any concerns about your feet or ankles, contact Dr. Michael D. Garvin from Florida. Our doctor will assist you with all of your foot and ankle needs. When buying flip-flops, try to find ones that have sturdy soles and that are made of high quality materials that will support for your feet. These flip-flops will cost more, but will also last longer as a result. When we use our feet everyday, it is almost impossible to avoid feeling soreness in them every once in awhile. Fortunately, there are ways you can help alleviate some of the pain you may be feeling after a long day of walking. Drinking green tea can help your body relax, and it will also give you the antioxidants needed to reduce inflammation. If the rest and relaxation isn’t enough, you may find that a massage may be useful. You can try placing a foam roller on the floor and moving it back and forth with your foot in order to gently massage it. These foam rollers may be used while hot or cold, and they will help with any pain or soreness you are feeling. Everyday foot care is very important to prevent infection and other foot ailments. If you need your feet checked, contact Dr. Michael D. Garvin from Florida. Our doctor can provide the care you need to keep you pain-free and on your feet. A research team at Ohio State University spent three years studying the relationship between stress fractures and the required healing time to return to running on a Division 1 team. The team was able to find that the average healing time of a Grade V stress fracture was 17 weeks. A Grade V stress fracture is a fracture that is often ignored or mistreated to the point where surgery is required. These researchers compared the BMIs of women who were injured with those who were not, and found that women with BMIs lower than 19 were at a higher risk of developing stress fractures. 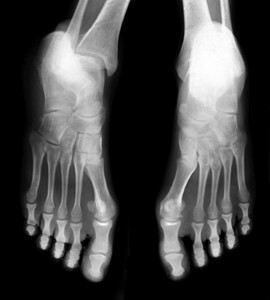 Activities where too much pressure is put on the feet can cause stress fractures. To learn more, contact Dr. Michael D. Garvin from Florida. Our doctor can provide the care you need to keep your pain free and on your feet.